Power generation and its implementation is a whole lot different than installing a conductor between two points and making connections. 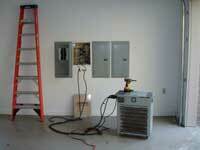 Most electrical contractors with correct training can install electrical panel system and associated branch circuitry. However these individuals may not be trained in electron movement, providing a means for that movement, and then keeping the electrons moving correctly at any load stage. Yes it can be complex, especially factoring in the different load characteristics present today due to better technology. Yes it takes an electrical contractor who specializes in power generation, who also provides service and repair for systems, to install systems which eliminate all the different failure scenarios. Practice does make perfect, without the experience in all conditions, at all load stages of different load characteristics, true knowledge does not exist. The number of factors which influence the electron movement is why. We are covering a few thru this page, however it is impossible to cover every reason for failure. That is the key, eliminate as many failure potentials as practical. Safety should be of concern, generators are stationary combustion engines, and there are carbon monoxide emissions. Additionally high exhaust temperatures combined with the fuel required to run combustion engine sets require fire prevention measures. They produce electricity so just as with the existing electrical system in your structure there can be shock hazards, but this is especially true with power generation systems. Entire Structure Load or Just the Necessities? 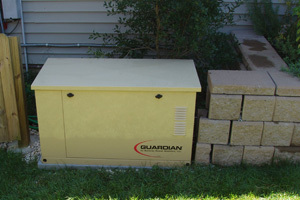 There are two methods which can be used when installing a back up generator system. The entire structure's electrical load can be afforded generator power or a circuit isolation method can be used to separate out just certain selected loads. Using the isolation method is used in order to minimize the generator size if there are budget concerns, and typically only basic necessity type circuits are selected. There is no standard list or rule for circuit selection of an isolation method style installation and it usually is different for everyone however the refrigerator, microwave, gas furnace, and well pumps are staples. For the circuits which are chosen it is important the loads are calculated and the generator sized accordingly. Additionally the installing company should understand the mechanics of not only the transfer switch but also the branch circuitry of a structure so that there can be no back feed of generator power back to the utility lines. For systems which afford the entire structure's electrical load generator power, the National Electrical Code requires that at least an optional load calculation is performed. This new law began in 2008 and covers optional standby as well as legally required systems. It is critical that proper testing of your generator occurs before you attach expensive equipment to the generator source. Voltage regulation, engine speed regulation, and fuel pressures require adjustment. It is common practice to isolate out only necessity type circuits of the electrical system to a separate sub panel and only afford that panel, usually identified as the generator sub panel the back up or emergency source of electricity. Using the isolation method requires an understanding of the branch circuitry of the electrical systems so as not to back feed the emergency source of power back to the utility source. Large or small, all systems should be load tested with external load banks to insure every calibration is made correctly. Generators are considered stationary combustion engine devices. They emit carbon monoxide when operating, which is dangerous and can be fatal. There are regulations, article 37 of the National Fire Protection Agency being one, which help protect the consumer when they are followed. These regulations along with just good common sense make these stationary combustion engine sets safe. Carbon monoxide detectors are a good idea when gaseous appliances or devices such as generators, gas logs, gas hot water heaters, or gas furnaces are being used at your location. So that the carbon monoxide from the exhaust emissions of the generator set can dissipate to safe levels before possibly entering structure if doors or windows are opened, 60" of clearance from the openings in the structure and the generator unit should be maintained. 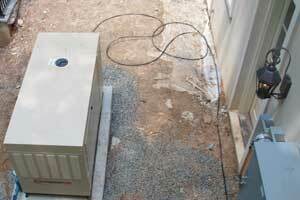 Adequate ventilation for your generator set is an important consideration which should not be overlooked. 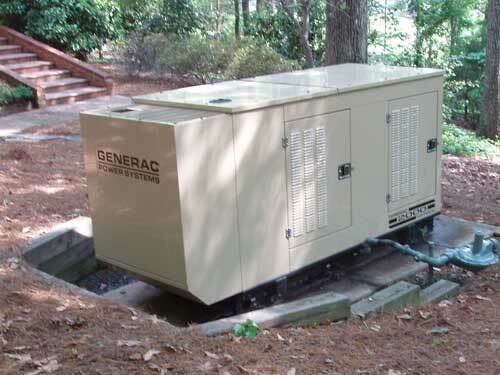 All generator product has been engineered for certain clearance requirements. Typically if the same 60" requirement of NFPA 37 is met enough clearance for proper ventilation would be afforded the generator set. Inadequate ventilation will lead to generator set failure and damage including, electronic controls, power windings, and all engine parts. Especially during high ambient temperature scenarios adequate ventilation plays a key role in success of your system. There are clearance requirements in front of all electrical or mechanical equipment for the safety of personnel during service or repair of equipment. For this air cooled product the air intake is on the right side of the enclosure. The cinder wall structure to the right of the enclosure will prevent adequate ventilation. 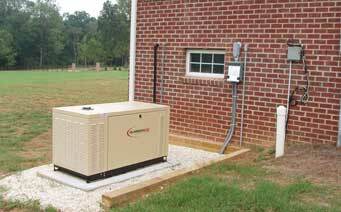 Over time damage will occur to the generator set and most likely the unit will overheat and shut down during an extended use period. 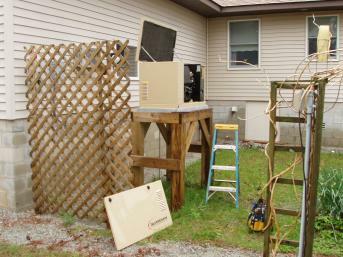 Although the bushes above do somewhat hide the generator they also will create an overheating issue for the generator which will damage all components of the generator. Servicing the generator for the technicians would be difficult which in turn increases cost for any repairs necessary in the future. Sometimes considerations have to be made for flood zones and the possibility of water rising above the pads for generators at ground level. It is possible to raise the generators on wooden or concrete structures but caution should be used when utilizing any combustible type materials. Solid construction is very important and making sure the base of the generator is kept closed will keep overheating issues at bay. Generators which are placed on grade with slope require a retaining wall which serves to direct water away from base location and also help hold the grade away from the generator as well. Adequate space between the base and any retaining wall structure has to exist to allow service and repair. Additionally rock is placed around the base to help keep combustibles in check. For locations that may flood during weather events it is necessary to raise the unit. The structure should be solid, well braced and supported for the weight of the unit and vibration. Erosion problems are common for new construction installations. due to backfill issues. 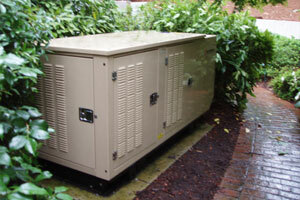 Electrical enclosures including the generator can become energized if correct grounding is not in place. Objectionable current issues can be very dangerous and the incorrect landing of the grounding or grounded phase conductors can create this type scenario. It is extremely important to use only qualified companies who understand the principles of grounding. Additionally it is even better to use companies who also understand electrical theory as it relates to initiating electron movement with onsite magnets present in the generator systems. For the electrical system to the right, selected circuits from the two right panels were relocated to the far left panel. 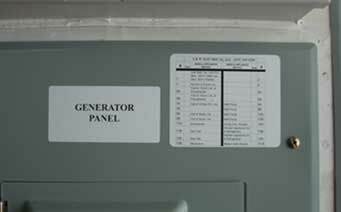 Only this panel is afforded generator power during a utility outage event. This eliminates the need for a larger generator. It is extremely important that consideration is given to the branch circuitry to insure no back feed condition will exist. 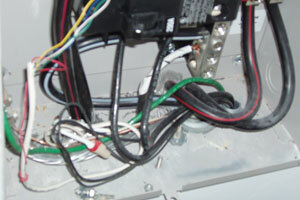 This can occur if a circuit is fed twice, from two different breakers from separate panels. It is a fairly common occurrence, so much so that it has become part of our inspection process. 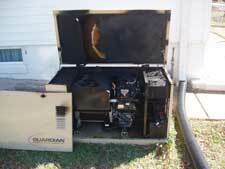 Other fire concerns are adherence to NFPA 37 which governs required clearance from structure, the use of correct second stage regulators in front of the generators fuel solenoid, and making sure combustibles are kept clear from the ground immediately surrounding the generator base and any area adjacent to the high temperatures from the exhaust. Pine Straw and any other highly combustible materials should not be placed anywhere close to the exhaust from a generator. Furthermore exhaust mufflers are metal and over time condensation will help create rust and when units are operating it is possible for hot embers to be expelled from the mufflers so good rock landscaping around the generator is highly recommended. Correct electrical wiring in a good workman like manner is extremely important for the prevention of fire. Effective grounding is critical in providing means for proper operation of overcurrent devices. 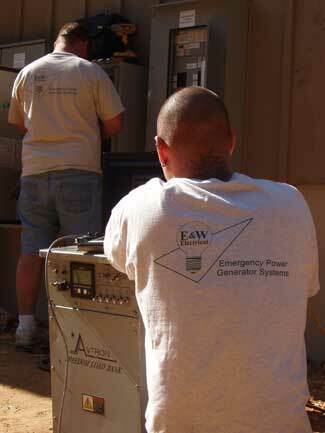 Using a seasoned generator specialist company can reduce chances of fire. Good connections of all conductors is very important and from a safety standpoint grounding conductors deserve special attention. Enclosure paint should be taken off and proper fasteners used. Additionally hard to see in this picture is a major violation, all conductors of a circuit must be installed in the same conduit, especially the grounded phase conductor. It is important to consider using manufacturers who have designed enclosures which will contain a fire. Malfunctions can happen, it is best to be prepared for worst case scenarios. Never use starter fluid to assist in engine cranking. 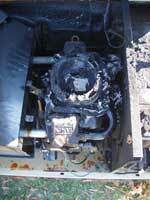 If the engine will not start, it is safer to call a generator specialist company. Pine Straw is extremely flammable. Some towns are starting to regulate how close to a structure the pine straw can be used as landscaping material. It should never be placed around a generator unit. Fuel pressures are critical when it comes to proper operation of a stationary combustion engine generator set. It is unfortunate however that inadequate fuel plumbing conditions are very common. 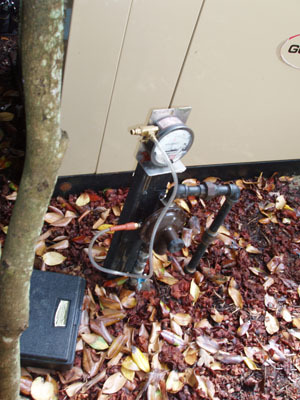 Some generators can consume in excess of 1,000,000 BTU's per hour so properly sized fuel plumbing at the correct pressure is a must. Although the only way to observe fuel pressure correctly is by attaching a manometer and external load bank, the procedure is rarely done by companies installing the generators today. Without observing gas pressure while stressing the unit to the maximum output capacity, a true picture will not be possible. If fuel pressures are not correct engine damage will occur, and voltage transients combined with low voltage conditions will exist. 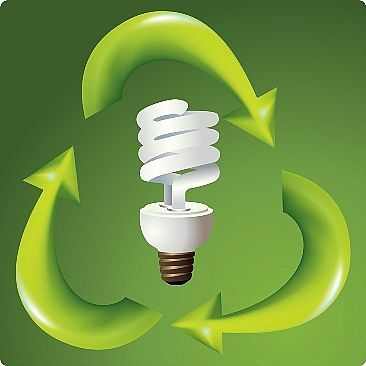 Due to the poor power quality damage will also occur to any electrical device attached to the system. The use of a correctly calibrated manometer during load testing is the only way to observe the gas pressures at different load stages. No more than 1 water column inch pressure difference should be observed between no load generator running and fully loaded. Today's technology has provided a lot of convenience and now even efficiency. These are both good things however sometimes this new technology can add stress to our electrical systems. For resistive type loads typical in most lighting and receptacle loads the current and voltage sine waves would be in phase and the power factor is not really an issue, however for newer electronic equipment, air conditioning compressors pumps, motors or appliances, out of phase current and voltage sine waves put additional stress on electrical systems by necessitating more current flow for the same use of energy. 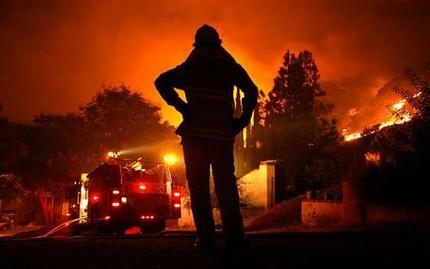 Smoke detectors today are pretty much a standard in structures. Fire extinguishers should become part of the plan as well. Although all gas appliances including generators are very safe, accidents can happen; it is better to be prepared.